A senior US diplomat visited Kurdish-held territory in Syria on Saturday as the minority negotiates with Damascus over the future of its semi-autonomous region. 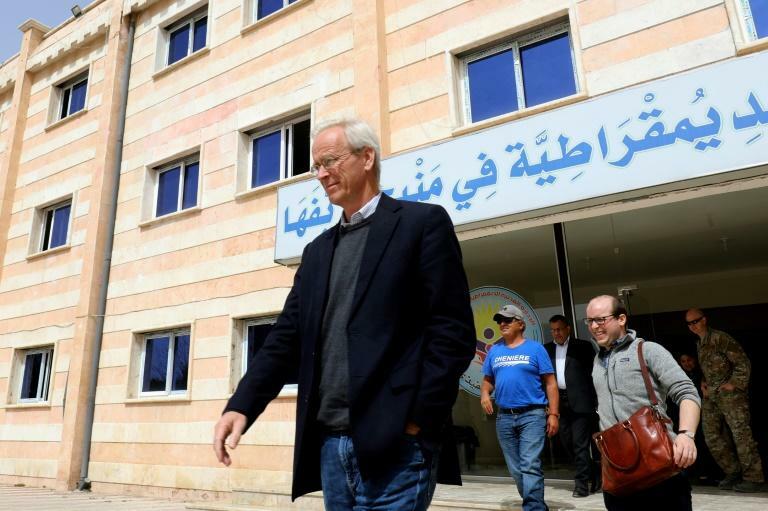 Ambassador William Roebuck was in the town of Shadidi in the northwestern province of Hasakeh after visiting the towns of Kobane and Minbej in recent days. He is expected to continue to Deir Ezzor, an eastern province where the Syrian Democratic Forces (SDF), a US-backed coalition of Kurdish and Arab fighters, is fighting the Islamic State group in the jihadists' last redoubt. "We are prepared to stay here, as the president (Donald Trump) has made clear, to ensure the enduring defeat of ISIS," Roebuck said, using an alternative acronym for IS. "We remain focused on ensuring the withdrawal of Iranian forces and their proxies as well." Support from Russia, Iran and Hezbollah has allowed President Bashar al-Assad's government to regain much of the territory lost to rebels and jihadists in the early years of the country's seven-year war. Iranian forces and Tehran-backed Shiite militias have also been key to Assad's recapture of large swathes of Deir Ezzor province, according to the Syrian Observatory for Human Rights. Syria's war has left more than 350,000 people dead and displaced millions since it broke out with the brutal repression of an initially peaceful uprising in 2011. With the regime focused on crushing the rebellion, Kurdish forces carved out a de facto autonomous region in the country's north and northeast. Roebuck's visit comes as the Kurds and the regime engage in difficult talks over the fate of territory under SDF control. Assad's government now controls nearly two-thirds of Syria and is determined to reassert its authority over Kurdish-held territory, which forms the lion's share of the rest.